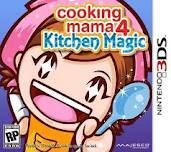 Flip Out Mama: Hot Gift: Cooking Mama 4: Kitchen Magic! Guess who showed up at my house today?? I love the Cooking Mama games, and I can't believe that Cooking Mama 4 is already here! This is Cooking Mama's debut on Nintendo 3DS, and we are super excited to check it out! I love that Cooking Mama is now on the 3DS! You can use the stylus now as the ultimate cooking utensil, using it to chop, stir, slice, knead, etc.. And now you can use the awesome 3DS gyroscope to crack eggs, grate cheese, balance plates and more! The 3DS gives a whole new spin on the Cooking Mama experience! A really cool thing about this Cooking Mama game is that you can combine dishes to make your own unique dish. There are up to 416 different combinations! The recipes this time around include Designer Cupcakes, New England Clam Chowder, Corn Dogs, Cherry Pie, and Many More!! We are getting ready to check out this awesome game right now, and we will be doing another write up to tell you all about it, but I just wanted you know to that Cooking Mama 4 is out, and if you wanna get it, just click here! &lt;p&gt;&amp;amp;amp;amp;lt;p&amp;amp;amp;amp;gt;&amp;amp;amp;amp;amp;amp;amp;amp;lt;p&amp;amp;amp;amp;amp;amp;amp;amp;gt;&amp;amp;amp;amp;amp;amp;amp;amp;amp;amp;amp;amp;lt;p&amp;amp;amp;amp;amp;amp;amp;amp;amp;amp;amp;amp;gt;&amp;amp;amp;amp;amp;amp;amp;amp;amp;amp;amp;amp;amp;amp;amp;lt;br&amp;amp;amp;amp;amp;amp;amp;amp;amp;amp;amp;amp;amp;amp;amp;gt;&amp;amp;amp;amp;amp;amp;amp;amp;amp;amp;amp;amp;amp;amp;amp;lt;i&amp;amp;amp;amp;amp;amp;amp;amp;amp;amp;amp;amp;amp;amp;amp;gt;&amp;amp;amp;amp;amp;amp;amp;amp;amp;amp;amp;amp;amp;amp;amp;lt;/i&amp;amp;amp;amp;amp;amp;amp;amp;amp;amp;amp;amp;amp;amp;amp;gt;&amp;amp;amp;amp;amp;amp;amp;amp;amp;amp;amp;amp;lt;/p&amp;amp;amp;amp;amp;amp;amp;amp;amp;amp;amp;amp;gt;&amp;amp;amp;amp;amp;amp;amp;amp;lt;/p&amp;amp;amp;amp;amp;amp;amp;amp;gt;&amp;amp;amp;amp;lt;/p&amp;amp;amp;amp;gt;&lt;/p&gt; disclosure: I received a sample copy in order to conduct this review. Although a sample was received, all opinions are my own and no monetary compensation was received.